As you are likely aware, last week President Trump decided to pull out of the Paris Climate Accord, a 2015 agreement between 196 countries to make drastic changes in an attempt to slow down climate change. Many people, including us, have been oscillating between outrage and sadness over this decision. Who else is angry? 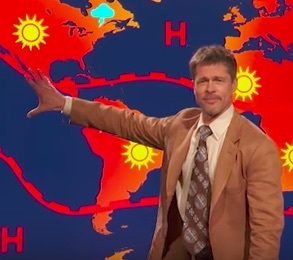 Apparently Brad Pitt, who made a special appearance on The Jim Jefferies Show recently as a fake weatherman to make a point about Trump’s decision making and the future of our planet. And, lo and behold, our weatherman is none other than Brad Pitt. He points to one portion of the map and says, “Things are going to be getting warmer in this area here,” only to point to the opposite side and say the same thing. The map seems to depict a world practically on fire, covered in intense sun, storms, and “H”s which symbolize high pressure. “Wonderful,” Jefferies says. Our sentiments exactly. Brad and Jim aren’t the only ones who have been vocal about their disapproval of Trump’s decision. 187 mayors nationwide have pledged to continue honoring the conditions of the Paris Accord. We’re glad people are talking about this. We hope that our country will begin taking more of an initiative in confronting climate change.